Carb Kits - A Comparison - NGWClub®, Inc.
First off, I am not a carb expert (or motorcycle for that matter.) Carbs have always intimidated me from a young age. The GL1000 series carbs are probably the most complex I have ever tackled. However I can "Google" with the best of them! With the resources available on the net, they don't scare me near as much now. With quality components and attention to detail, most of these can be brought back to their former glory. Now lets look at some kits. I will be concentrating on kits for the 78-79 GL1000 because that's what I have. I have no doubt that kits for other years will be similar in quality, content, and construction. This compilation was done with my personal research, observations, and comparisons. If you have a problem with with anything posted, your problem is with me and no one else. As this will be an ongoing project, the thread will be locked and not allow comments. This will allow any additional posts I make to remain to be grouped together. 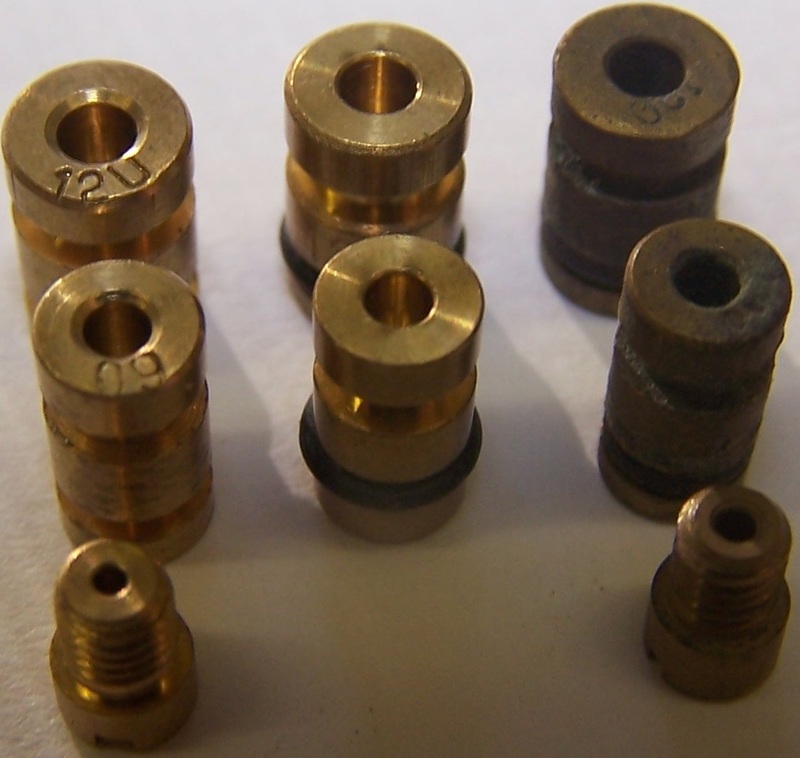 A separate thread Carb Kits - A Discussion is provided for discussions, comments, corrections, etc. Please lets keep it civil. Many thanks to Randakk for answering my questions and giving me permission to use content from his webpage in compiling this article. While the information from his site is readily available, this enables me to pull it all together in one place. As such, consider all copyrights there to apply to this compilation. Intellectual Property Notice: All material appearing in this website is the property of Randall Washington, and is protected under United States and international copyright laws. The photographs, text and other content may not be copied, reproduced, distributed, stored, or manipulated in any manner without the express written permission of Randall Washington. And thanks to jethro1954 for the Barracuda carb kits. Without those I wouldn't have anything to compare. Saber cycle wrote: Honda never made OEM carburetor rebuild kits but sold each component by piece. 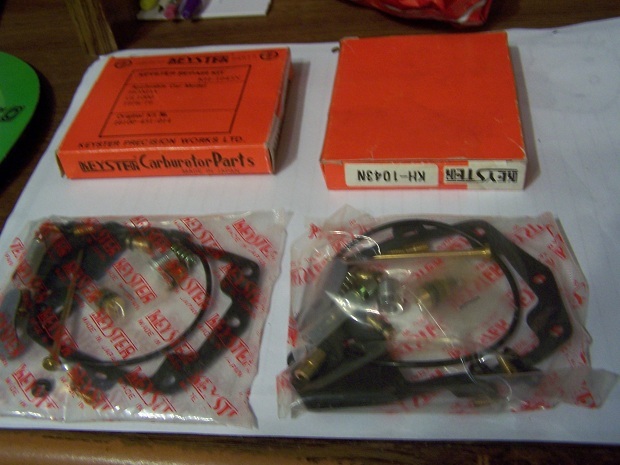 Carb kits were an aftermarket creation of which Napco and Keyster were the most popular brands. Our kits compare to the Napco kits, which were the most complete on the market. 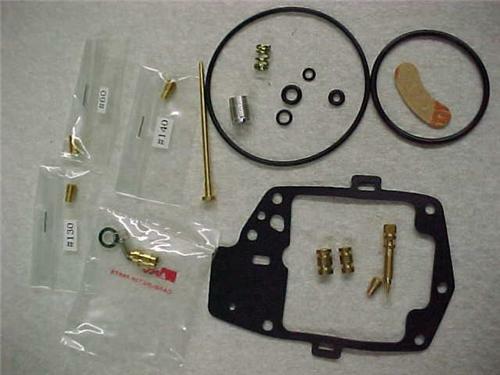 Carburetor repair kit to rebuild one OEM 1978 or 1979 GL1000 Keihin carburetor model IDs 769A and 771A. Owners of non-emissioned control 1978 may have to reuse their primary main and slow air jets. This tells me that this kit is NOT correct for the 769A's. First look reveals that the box is very similar to the Napco kit pictured above so I assume they are sourced from Napco or one of Napco's suppliers. Before opening the package I can see that the air jets are individually packaged with the size marked on the packaging. There are no markings on the jets, so once removed from package, the size is unknown. Also the float bowl gasket has no internal cording reinforcement to help maintain shape. The K&L kit appears to have the most complete set of internal hardware. 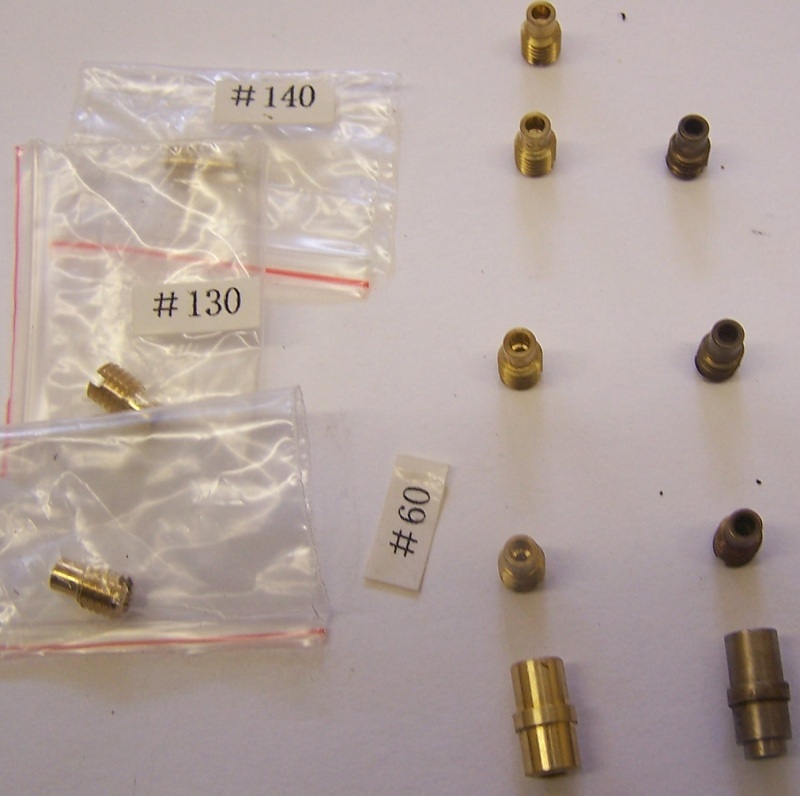 All jets for both carb types are there plus: the rubber plug for the slow fuel jet, primary emulsion tube, carb to head air intake oring, nut, spring and washers for linkage adjustment? Doesn't have the needle though. Other pics show the linkage adjustment screw as well, but I like this pic better. The Keyster kit. The float bowl gasket has internal cording reinforcement and the jets are marked. It appears to have air jets for 769A's and 771A's, but not the slow idle fuel jet. The "hat" for the secondary emulsion tube is included but, it is brass instead of "stainless" and is not shaped exactly like OEM. I don't know if it needs it, but the idle adjustment screw/needle has a protective shipping cover. The Napco kit seems to be identical to the Barracuda except for an additional o-ring that looks like it's for the intake manifold. Honda has a "packing kit" of the "soft" parts, ie no brass. It is the only known source of the "bumper ring" new, that the slide contacts when bottomed out. They rarely go bad though. 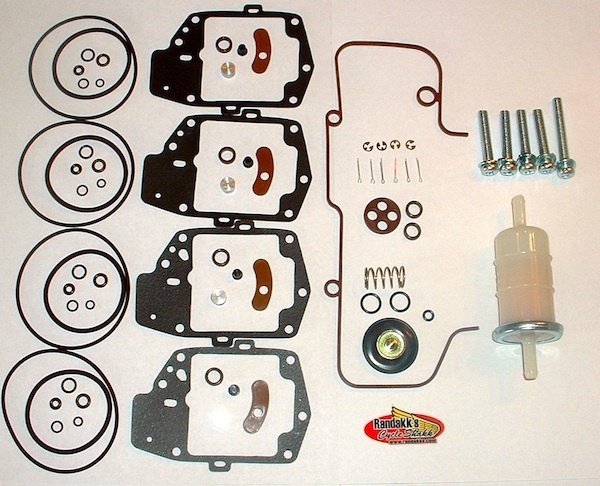 Randakk's GL1000 Master Carb Overhaul Kit. This kit almost doesn't belong here, it is so much more than a carb overhaul, more of a fuel system rebuild. Not only does it include all soft parts for all 4 carbs, but also intake manifold orings, fuel petcock rebuild, plenum gasket, air cut-off valve rebuild, fuel filter, and miscellaneous hardware that is difficult to find or not available anywhere else (ie. 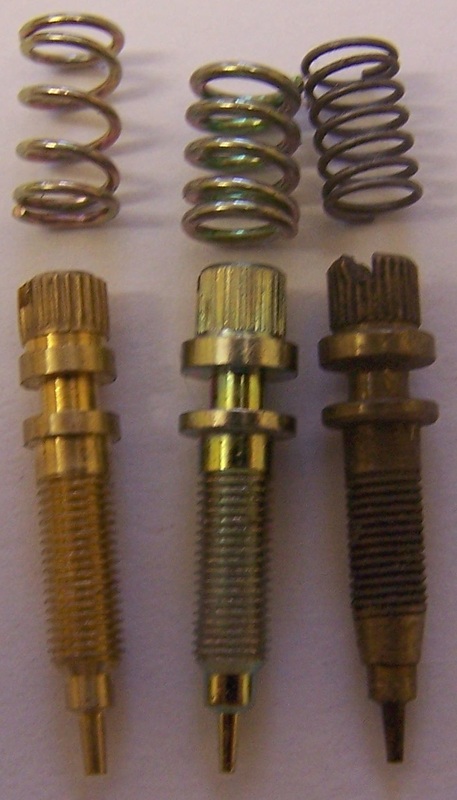 linkage cotter pins, e-clips for the 75 linkage, "pucks", and replacement plenum screws.) It however does not include any jets, float valve, needles, or emulsion tubes. There has been issues with aftermarket copies of these items, so OEM is recommended "IF" they need replaced, usually they just need cleaned. Another very important feature, all orings are made of Viton and soft parts that aren't Viton, are selected of the highest quality available. With all the "crap" in gasoline now a days, rubber that was fine with 70's and 80's gasoline, can't cope with what we have to use now. There is also a kit distributed by Tour Max, that I understand is made by Keyster. It includes the soft parts and the float valve. I have found others, but they seem to keep coming back to Keyster or Napco. One nice thing about the OEM float valve set from Honda is that it also includes the inlet screen, which is not provided with any aftermarket GL1000 float valves. 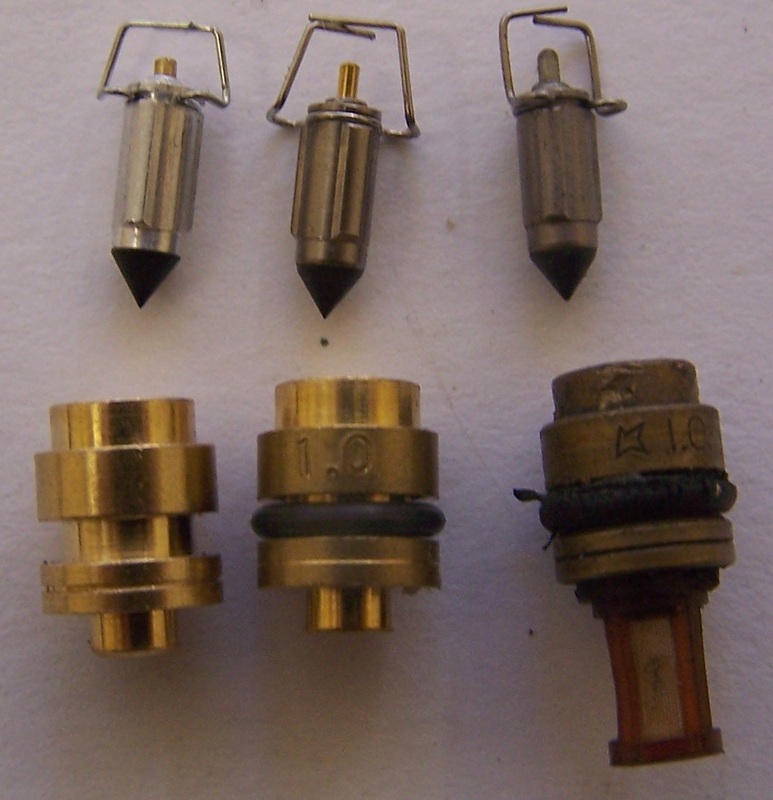 In the past, problems arose with bad batches of aftermarket float sets which had valve needles that were too short. These were either manufacturing errors or packaging mistakes. In these cases, no matter how high you set the floats, the valves would never close completely. Flooding was inevitable. There is still some risk if you purchase aftermarket float sets that you will receive merchandise from these prior bad lots. OEM has never been documented to do that! The only way to go is OEM Honda. These are pricey, but easily last 25 years and 100,000 miles. Honda also includes the inlet fuel screen with their set (very important!). I don't know of another source for these screens. They are not available separately and not included with aftermarket sets. Also, aftermarket float valve and seat sets are notorious for leaking! For the float valves the 'plunger' in the Barracuda is shorter than the other two and the retaining clip is shorter to compensate. It's seat is also the only one not size marked. The tip on the OEM "plunger" appears rounded while the aftermarkets are squared off. Using a welding tip cleaner as a gauge (use what I have), the Keyster and OEM seats measured the same. The Barracuda, however, allowed two sizes larger to pass thru. And of course the OEM is the only one with a filter screen. Left to right Barracuda, Keyster, OEM. 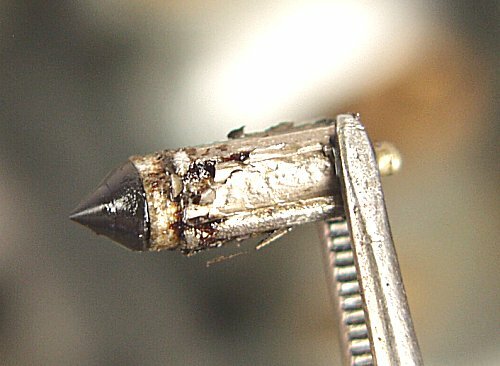 Randakk wrote: Recently, I've discovered some improperly sized jet needles that were provided with aftermarket carb rebuild kits. The needles looked identical to the original but did in fact have a significantly narrower cross section at the mid-point of the tapered section. Effectively, this made the needles much richer. The brand in question is NAPCO and the kits were for a '76 which happens to be one of my bikes. The result of these improper needles was the bike in question ran fine near sea level (although a plug check showed it was running slightly rich in the mid-range and the fuel mileage was terrible). The real problem showed up at altitude...I spent 3 days riding on the Blue Ridge Parkway in NC at elevations ranging from 2000-6000 feet. The bike was fine below 4000 feet elevation, but above this elevation it would foul all 4 plugs in about 20 minutes of riding (at sustained 4000 rpms!). I know from prior trips that this particular bike always ran fine at these altitudes. Suspecting the recently installed aftermarket needles, I measured them when I got home and sure enough they were significantly undersized...thereby flowing too much fuel at a given midrange throttle position. Observation shows differences. The lengths and points are not the same. Don't think either aftermarket are suitable as a replacement for OEM. Left to right, Barracuda no markings, Keyster Keyster part number, OEM Keihin part number. Randakk wrote: Caution: the NAPCO kits contain 3 jets which are identical except for the orifice size: idle air, primary air and secondary air jets. They are NOT stamped with the jet size on the jet as OEM jets are. These 3 jets come in individual plastic bags with labels indicating the jet size. It would be very easy to screw up the placement of these jets so be careful out there. However, in my experience, jets and jet needles rarely wear out, so you may not need them. Like the Napco, the Barracuda air jets have no size markings and the markings on the packages are subject to falling off. Using the tip cleaner as a gauge, the 60's measured the same, but all the other sizes were smaller when compared to the OEM. On the 'top hat' at the bottom it can be clearly seen that it doesn't have the part that goes inside the emulsion tube, making it like one piece. Left to right Barracuda, Keyster, OEM. The idle air adjustment screws appear to have differences in the tip, especially on the Barracuda. This could lead to difficulties when adjusting "by the book" as the flow would not be correct at a specific setting, ie 2 turns out from seated. The aftermarket springs are bigger and stronger. This may lead to damage when "lightly seating" the screw due to the increased force required to compress the springs. Left to right, Barracuda, Keyster, OEM. Randakk wrote: The Keyster gaskets are laminated with an integrated layer of fiber reinforcement to provide size / shape consistency which prevents distortions in use. The Napco version does not have this fiber reinforcement and are made from a different type of synthetic rubber. Both types of gaskets are certified for use with "normal" gasoline blended with ethanol...like E10 or E15. Both Keyster and Napco market their wares under a variety of brands and private labels. For whatever reason, some portion of the NAPCO gaskets seems to be overly reactive with gasoline...possibly susceptible to ethanol (or other oxygenating agents) and sometimes swells when exposed to fuel. The problem is that occasionally the gasket can swell to the point that float operation can be affected. The symptom is sudden, severe flooding in recently overhauled carbs that performed perfectly when first put back into service. The curious thing is this seems to occur in isolated cases...most are fine. The problem seems to originate in areas where ethanol blends are more prevalent and have higher concentrations. Slightly under-torqued float bowl screws contribute to the problem, This permits the gaskets to "creep" inward when the clamping pressure is too low. I realize that this is a dangerous thing to mention as these screws are easily stripped! Slightly mis-aligned float ...when splayed outward, they are less tolerant of gasket "creep"
One case involved the admitted introduction of forbidden E85! Curiously, some batches of fuel (from different gas stations) that I tried did not cause the swelling which makes me certain that some aspect of fuel composition is the culprit. That alone is enough to convince me to only use the reinforced gaskets, which Barracuda and Napco do not have. Also note that the Barracuda gasket (left in photo) has narrower and uneven sides. They may have removed some material to alleviate the gasket "creep" flooding problem. I think it would do the opposite and make the gasket weaker and more problematic.